The next generation of onboard scales will be on show at the Loup Electronics booth at Conexpo 2014, offering the widest choice for all types of loaders and excavators. CONEXPO-CON/AGG will take place in Las Vegas, USA, in mid-March, and will showcase the newest equipment, technology and product breakthrough in construction. Making its market debut, LOADEX 100 is a retrofittable scale installed on both tracked and wheeled 360° excavators and material handling machines to weigh the amount of net material load in the bucket or grab. Up to two pressure sensors are installed into the hydraulic lift system, with the addition on machines with assistor accumulator cylinders, of up to two more compensation pressure sensors. The pressure signals are captured, filtered and corrected by measuring the angle of the main boom using either an RDS Inclinometer or Mechanical Angle sensor. Dipper arm position corrections are made from a mechanical angle sensor mounted on the boom to dipper arm elbow pivot. This provides fast and precise dipper arm angle measurement that is not effected by inertia G-forces or acceleration effects. Slope corrections are made from another inclination sensor on the chassis. As an added option, oil temperature compensation is provided by a clamp on temperature sensor. Ultrasonic technology is used to provide reliable and precise bucket position compensation. 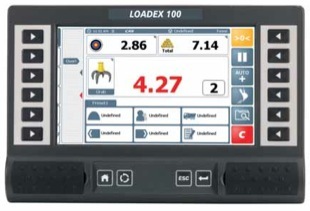 All calculations are made in the LOADEX 100 Weighing Module, with the resultant calculation sent via CAN protocol to the LOADEX 100 terminal in the cabin. Load and store information is saved in the terminal where it can be distributed to an in-cab printer, modem or internal SD flash card. Also making its CONEXPO debut is the new WEIGHLOG VUE on-board weighing scale for wheeled loaders. An all-new CAN-based system combining cutting edge sensor technology and signal processing techniques, the WEIGHLOG VUE provides precise and consistent bucket weight information and emphasizes the gains in productivity and profitability that can be achieved with such technology. Designed to operate within the fastest loading environments and toughest of conditions, WEIGHLOG VUE reduces cycle times and maximizes tons per hour performance. The new WEIGHLOG VUE uses a 7” colour, resistive touch screen display and additional physical keys providing a modern and ergonomic operator interface. The system continually measures hydraulic pressure using up to four sensors. The pressure signals are captured and filtered through a weighing ‘arc’ provided by inclination sensors measuring the angle of the main boom. All signals are processed in the RDS Smart Box and the resultant weight calculation is sent to the terminal mounted in the cabin. SQL database capability with up to eight reference fields providing virtually unlimited inputs of products, customers, trucks, hauliers, locations, destinations, mix blends and notes. There is a blend facility with an infinite number of mixes and products. GPRS or Wi-Fi connectivity provides one or two-way communication with the back office to send and receive job information. For smaller loaders and skid-steers, Loup offers the WEIGHLOG 3030, which also benefits from a colour touch screen display. This instrument is a user friendly on-board weighing system which provides accurate and consistent bucket and total load results, meaning stock management and check- weighing operations can be controlled more effectively.